There he was the night before last, with a shot similar to the one above – CBS-TV’s Lonnie Quinn in NY with his sleeves rolled up, top button unbuttoned, and tie loosened, issuing the clarion call to hunker down for the the bombastic blizzard that failed to materialize in most of the NJ/NY area. Meteorologists are rarely contrite about their incorrect forecasts. They bank on us being thankful that we dodged a bullet, rather than on being annoyed that their forecasts influenced mayors and governors to close schools, shut down businesses, and declare states of emergency that kept roads closed. We’re expected to feel fortunate that the road crews were out all night keeping things clear. And indeed I do feel fortunate in many ways. The only reason I’m being cynical about this is that there was Quinn, leading the 11:00 PM news last night, proclaiming that there were still some doubters out there on social media questioning whether the storm could be a bust. He stood firmly by his Quinndex, guaranteeing that the conditions were still in place for this to be an historic storm. The first sign that Quinn was wrong came from this graphic at 8:50 PM. 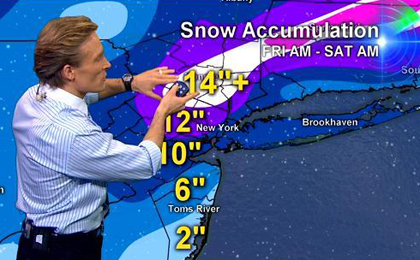 The Weather Channel had already downgraded the NYC predictions from their original 12″-24″ to 5″ – 8″. But Quinn and colleagues who get paid quite handsomely for their right or wrong forecasts do what they always do in situations like this. 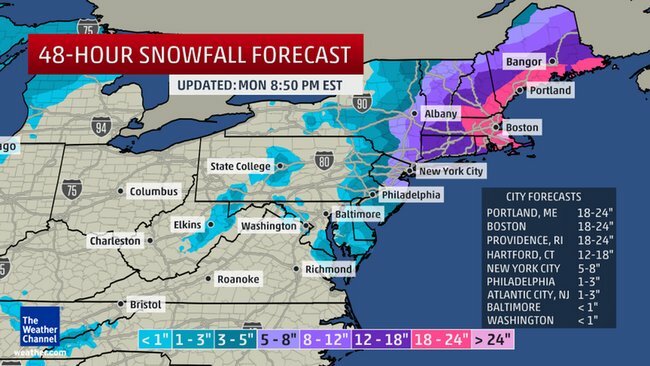 They focused on how bad conditions were in terms of cold and wind and … out on the tips of Long Island … and well up into New England which, by the way, is well out of Quinn’s viewing area. So Lonnie will pack up his shaving cream, roll down his sleeves, button his top button, and tighten his tie before heading home tonight (Gov. Cuomo lifted the travel ban in NY and Gov. Christie in NJ effective 7:30 this morning) with nary a word of contrition. The only thing historic about this storm was how historically incorrect the forecast was for most of Quinn’s viewing area. There was however a breath of fresh air from one meteorologist at The National Weather Service. On Monday the NWS was still warning of “crippling snowfall amounts” and potentially “life-threatening” blizzard conditions in our area. But early this morning, Gary Szatkowski the meteorologist in charge of the office for New Jersey and Philadelphia, issued a public apology on Twitter, saying the storm was a big forecast miss for most of the region. Szatkowski added: “Thank you to the many folks who have been very gracious on social media this morning. Much appreciated.” Quinn would do well to share a bite of Szatkowski’s humble pie. They can’t have been wrong about this; aren’t these the same pseudoscientists who taught us about global warming? I suppose that part of what rubbed me the wrong way with all this is that at no point until what wasn’t happening was obvious to anyone looking out of the window, TV stations in our area were still doing the Chicken Little routine, cautioning everyone what Snowmaggedon was still imminent and not to be fooled by the inactivity. It was media hype, and the explanations should have unfolded in real time, not after-the-fact. Nothing wrong with erring on the side of caution. Everything wrong with continuing to whip people into a frenzy.